Lupus, or any chronic illness for that matter, changes a lot about life. It affects our financial situation as much as anything else. For most of us, being sick interrupts our working life. It stops some people from working all together, it limits the amount of time others can work, and the kinds of jobs they can maintain. It's simple logic - a life-long illness, affects our income life-long. There are a number of forms of Government assistance for people with chronic illnesses, and these really do make a difference. For various reasons, not everyone who has to stop work because of illness is able to receive a pension or other assistance. A partner's income may, or your assets may put you just outside of the range of receiving government support at all, even if the additional expenses of having a chronic illness, then reduce what is left to live on is far less than the income limit. 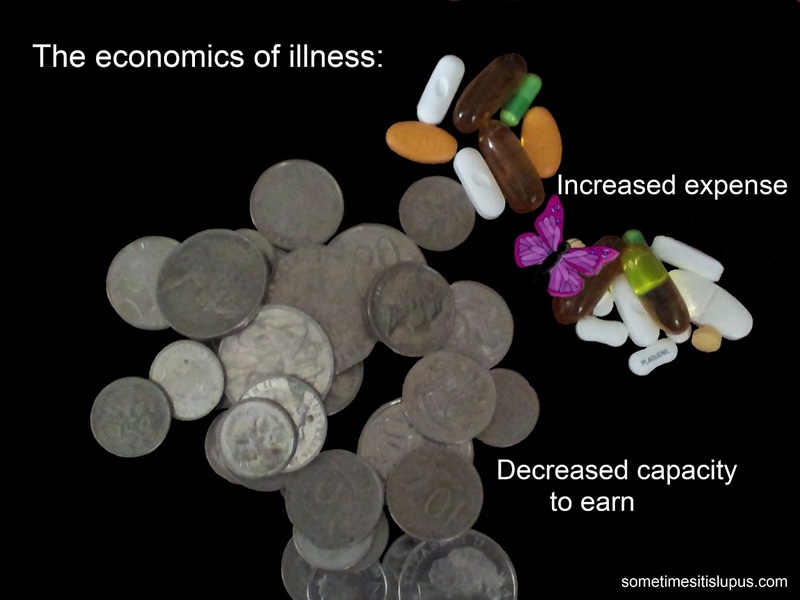 With or without assistance, what people with a chronic illness are able to earn or receive as unearned income (eg a pension), is usually far less than they would be able to earn if they were healthy. Expenses include medication, doctors visits, physiotherapy, and other ancillary medical services. Those are the obvious things. There's things other people don't think about as well. For example, I had to change cars: I'd been driving a manual car that didn't have power steering, but changing gear and turning an unpowered steering wheel got too painful for my left shoulder. If hanging clothes on a line is too difficult, using a clothes dryer uses extra electricity and is expensive. LED lights are more expensive than fluorescent lights, but are safer for people who react to ultraviolet light. Gluten free foods are often more expensive than their non-gluten-free counterparts, but for quite a few people with lupus, gluten can cause inflammation, and irritable bowel. Also with regard to food, fatigue and pain can make cooking too difficult, but eating out or buying pre-packaged food is more expensive and usually less healthy. Many people with lupus react to changes in temperature; for example heat makes my fatigue worse and cold makes my pain worse. Air conditioners are expensive to buy and to run. The nett result is that people with chronic illnesses are usually in a far worse economic state than they would have been if they'd not become sick. Amen. Lupus forced me into bankruptcy, put me on food stamps, etc. I've lost everything to Lupus, including a successful career, but the good news is I finally received my disability along with my lump sum and I am slowly rebuilding. You really have to carve out another way to find happiness when you become catastrophically ill.